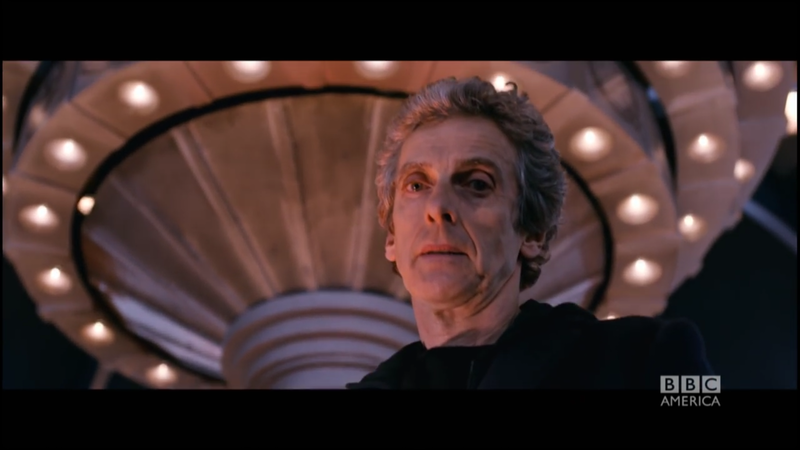 Doctor Who undergoes its periodic changes from time to time, and our last big change was the arrival of Capaldi’s version of the Doctor last year in series 8. Series 8 was very much a mixed bag, and unfortunately it often seemed like the bad outweighed the good. And in a lot of ways, Doctor Who Series 9 has been much the same, but a clearer vision emerged as it went on. This season has been made up almost exclusively of 2-parters with running subplots, continuing the trend established last year. And there were also huge revelations and things we the fans have been waiting for appearing at last–but was it all done in a satisfying way? The one thing this season definitely had over last season was starting off on the right foot. “The Magician’s Apprentice/Witch’s Familiar” was an excellent two-parter, with great character drama between the Doctor and Davros (in stark contrast to Davros’ “raving lunatic” persona in his previous appearance) and a fascinating relationship between Missy and Clara. You can almost see why the Doctor and the Master were once friends, and why they still consider each other to be so close. There were a few missteps here, no doubt (stopping the planes was a rather stupid and obvious tactic), but overall it was an invigorating return to form after the letdowns last year. Without the pressure of establishing a new lead, the show felt like it was back. I just never got the feeling from her that she’d actually gone through as much as she should have. The momentum slowed gradually, however, and I feel like that can be attributed to one thing: the character of Ashildr. I’m sorry to anyone who’s a fan of her, but I did not find her compelling in the slightest. I don’t watch Game of Thrones and have no familiarity with Maisie Williams, so I was coming into this blind. I don’t know if this is why, but I wouldn’t be surprised if that was the case. Her introduction in “The Girl Who Died” is fairly dull; she’s nothing special, and we’ve seen many characters like her before, especially during Tennant’s era: People inspired by the Doctor to take a stand and who were killed as a result, only to be saved in a less-than-ideal way. In her second appearance, “The Woman Who Lived,” where she’s taken on the grammatically confusing and incredibly self-centered name of “Me,” she’s pretty much just a horrible person who was willing to sell out the whole planet for a chance to relieve her boredom. In her third appearance, “Face the Raven,” she’s once again betraying the Doctor and acting as a literal back alley dictator, making her responsible for both Clara’s death and the Doctor’s multi-billion year imprisonment in the confession dial. And then finally she comes back for “Hell Bent” and the Doctor is somehow pleased to see her? Nope, sorry. She’s not a good person and the Doctor usually doesn’t put up with that, and that goes double for Twelve. She’s not even an interesting character, especially compared to other immortals like Jack. Having half the plot of the season hinge on her success was a risky move that just didn’t pay off. And then there’s Clara. I hadn’t felt strongly about her either way for most of her run; she didn’t have quite the same likability as Donna or Amy or Rose (although I’m sure there are plenty of people willing to argue the latter two at least), but she wasn’t actively irritating for the most part. “The Impossible Girl” thing was a little tired, and even more so in retrospect since it had little to do with her character from that point on. A lot of fans who dislike Clara attribute it to Clara being given a position of extreme importance to the Doctor’s life, something that was also said about Rose. Clara blows Rose out of the water, though, when it comes to that, with her “splinter Claras” being present at so many important junctures in the Doctor’s life and her role in stopping his use of the Moment in “Day of the Doctor.” That’s taken a step further this season, when the Doctor LITERALLY almost destroys the universe to bring her back from the dead. Remember, this is something that he abhorred the other Time Lords for attempting, and they were trying to save their entire civilization. This is ONE single human girl. The Doctor never risked the universe to get Rose back from Pete’s World, and he never risked it to get Amy and Rory out of 1930’s Manhattan. Nor did he do this for his only other deceased companion, Adric from the classic series, and Adric was the last person he thought of before his regeneration. So if your problem with Clara was based on how unrealistically important she’d become, this season did nothing to help that problem. Pictured: Missy and her pet. No, wait! Stop the fanfics! Clara finally developed an interesting character arc this season based out of some of the themes that had emerged last season, and that was a riff on the common idea that it’s dangerous to be around the Doctor. For Clara, being around the Doctor was even more dangerous than it usually is, as she began to pick up his mannerisms and take on a kind of thrill-seeking behavior that was based around throwing herself in harm’s way at every juncture. It first really showed up in “Flatline” last year, and grew as Missy dismissed her and showed how little she really knew. Clara started trying to pull off her own plans the way the Doctor does, and this is ultimately what cost her her life. It was a poignant end to her character’s arc–Clara isn’t the Doctor; she doesn’t have the knowledge and experience that the Doctor does, and most of all, she only has one life to spend. Her trying to become him could only ever end in tragedy. It was a bold move, and one that paid off in the intense drama of “Heaven Sent,” arguably one of the greatest episodes of Doctor Who ever made. …and then Moffat proceeded to immediately render all that pointless. 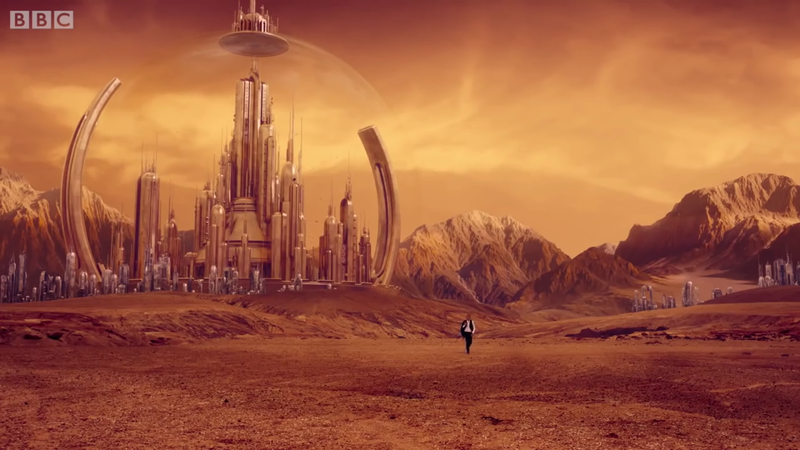 “Hell Bent” takes the return to Gallifrey, something the show had been building up to for 2 years, and relegates it to a backdrop. There’s still some great stuff in the 15 minutes we spend there, like banishing Rassilon, but it all takes a back seat to resurrecting Clara, and then running into Ashildr and finally giving the two of them their own TARDIS, so that Clara can now LITERALLY become just like the Doctor. Clara’s death had some meaning to it before, and “Heaven Sent” is all about grieving and vengeance. As the Doctor says, “It’s funny, the day you lose someone isn’t the worst–at least you’ve got something to do. It’s all the days they stay dead…” The episode went to great lengths to show us that. 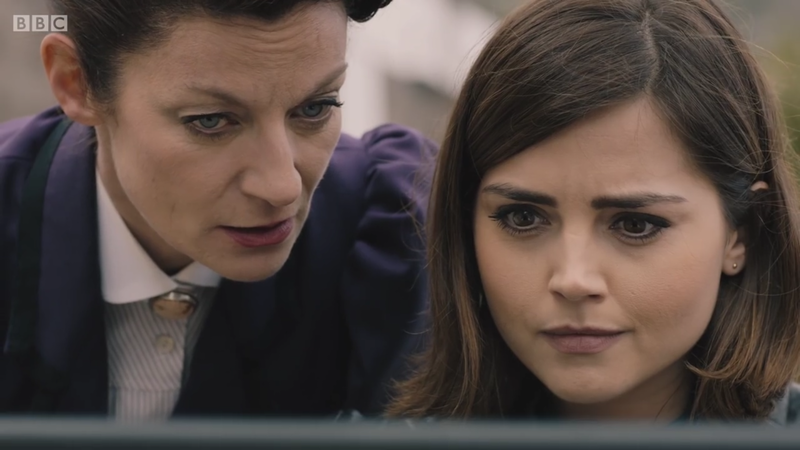 Right up until the memory-erasing device came up, “Hell Bent” still could have been a great capstone to the season–to have Clara demand to keep her memories, even if that meant she had to die. To teach the Doctor once again that he isn’t the one who gets to decide who lives and who dies; a reminder that he isn’t the Time Lord Victorious. Instead, Clara is actually better off for having died. Not only does she have a TARDIS now, but since her biological functions have been frozen in time, she’s not just effectively immortal, but actually, completely unkillable. She is invincible, which is even better than regenerating. No matter what trouble she gets into, nothing bad can ever happen to her (or Ashildr, for that matter). Sometimes literally just a backdrop. It’s becoming clear, at this stage in Moffat’s time as Showrunner, that he has a hard time killing characters off. Amy and Rory’s “terrible fate” was being stuck together back in the 1930’s, with all the foreknowledge of what was coming. We had already established at this point that they had very little attachment to their life in the present, with basically the only person who would care about their disappearance being Rory’s father. Basically, they just lost access to modern technology. Even going back to his time under RTD, the only character who actually died was Madame de Pompadour, and that’s probably because she’s a historical person whose death couldn’t be easily retconned. This tendency definitely reaches its absurd conclusion with Clara, whose death is likely to be longer and more exciting than her life ever was. Sure, she has to go back and die some time, but… everyone dies some time. Clara gets to choose. She lost any semblance of relatability in that moment. Heaven Sent–Amazing character piece giving Capaldi the chance to shine. Script, music, acting, directing… everything came together perfectly. The Magician’s Apprentice/Witch’s Familiar–Interesting twist on the traditional dynamic by casting Missy in the Doctor’s usual role. The Zygon Invasion/Inversion–First part is meh, but the second part contains an excellent speech from Capaldi, and picking up from the 50th is interesting. Face the Raven–Pretty good episode if you ignore the fact we’re somehow supposed to sympathize with Ashildr. Very dramatic and moving death scene for Clara, even in retrospect. Hell Bent–As I said above, it’s pretty good right up until they run into Ashildr and the Doctor’s memory wipe plan is revealed. After that, it’s off the rails, which drags down its spot on the rankings. 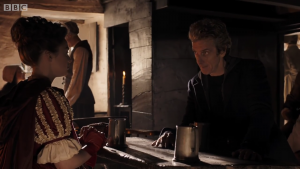 Under the Lake/Before the Flood–Solidly creepy first part with a less satisfying conclusion than you might have hoped for. The Girl Who Died/The Woman Who Lived–Depends entirely on how much you like Ashildr. If she doesn’t win you over, there’s very little else to these episodes. Sleep No More–Props for experimenting and trying something new, but this just didn’t work. The monsters looked awful and found footage is way past its heyday. Overall, I’d put this season towards the top of the stack; still not living up to series 4 or 5, but just as good as 6 and definitely better than the last two. An upwards trend in quality is always welcome. Well, do you agree with my assessment of Doctor Who Series 9? Or perhaps you’d like to convince me why Ashildr is actually an interesting character after all? Leave a message in the comments, or on Twitter @RetroPhaseShift. And either way, please do share it!